This is the original FELCO design, and has remained unchanged for over sixty-five years. 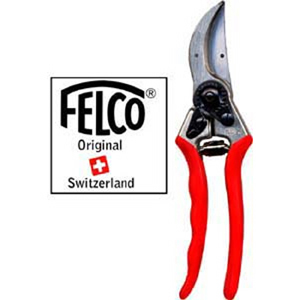 Imitated the world over, this popular model, like all the other FELCO models, continues the tradition of workmanship. Solid-forged metal alloy handles are complemented by a Swiss precision made hardened cutting blade (replaceable) and an anvil blade with sap groove. A hardened bolt and nut assure exact adjustment of both the cutting and anvil blades. A rubber cushion and shock absorber provide smooth working and soft closing of this pruner. Overall length is 8 1/2" long, 8.5 ounces.